Are you having trouble sleeping? Do you find yourself thinking or worrying when it’s time to sleep? Do you fall asleep quickly but then wake much earlier than you’d like? Or does it take you a long time to fall asleep? What would it be like to experience a complete sleep every night? For many of us, sleep is the only time when we are able to let go, rest and forget for a while our cares and responsibilities. When our sleep is troubled in some way, it can be a very painful experience. Often we develop anxiety and even strong fear around bedtime or even during the day when we think about the night ahead. This can lead us to develop negative sleep habits. 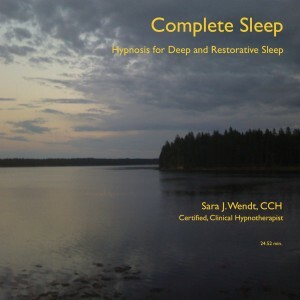 No matter the cause of your particular sleep problem, hypnosis: guided visualization and suggestions for sleeping deeply can lead you toward better sleep. This recording can help you practice falling asleep more easily and staying asleep. Please contact me with any questions about your sleep and this hypnotherapy Mp3. Sleep well!